Why spend a million dollars on an untried yearling with an uncertain future when you can buy a piece of history that will endure forever? We’re not talking just any piece of history, but items that represent three superstars of The Turf, Secretariat, Dr. Fager, and Arts and Letters. These items will be unveiled for display at Equestricon in Saratoga Springs for initial registration and early bidding on August 14 and 15 and will continue online for another six weeks where interested buyers can continue to bid. The catalog showing the items will come out shortly after Equestricon, and will be mailed to interested parties in early September. 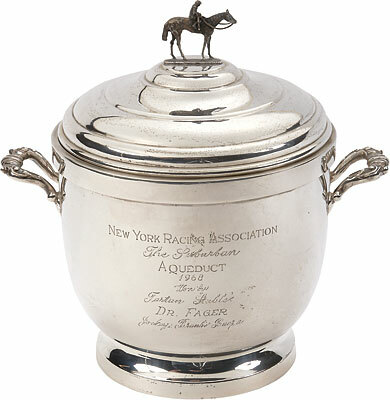 The Dr. Fager and Arts and Letters items for sale are the trophies belonging to their Hall of Fame jockey Braulio Baeza from the Suburban Handicap and Woodward Stakes, respectively. Finally, from the treasure chest of Secretariat’s Triple Crown come items that were either worn by Big Red or went into battle with him. Those attending Equestricon can view the actual authentic 1A armband worn by Ron Turcotte in the Kentucky Derby, the original Preakness Winner's Garland, and Secretariat's own Belmont Stakes Presentation Blanket from the private collection of Penny Chenery. I had the pleasure of writing the history and description of all five artifacts for the catalog, which you can read below. It not only provides a look at each one, but the story and historical significance behind them. At the Equestricon premiere, advanced bids on all five select auction items will be accepted by notable sports auction house Lelands, and bidding will continue online for several weeks through the website Lelands.com. Turcotte’s 1A armband has been in protected storage during the past 44 years, a coveted keepsake from Secretariat’s record-setting win in the 1973 Kentucky Derby. The Preakness garland has been displayed at various venues during the past year in anticipation of the auction, and its proceeds will benefit R.A.C.E. Fund, the Thoroughbred Aftercare Alliance-accredited charity assisting racehorses in need of retirement and rescue from slaughter. 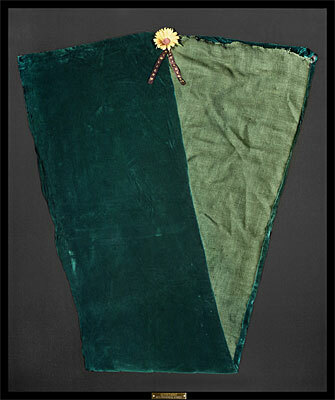 The 1973 Belmont Stakes Presentation blanket, a personal favorite in Mrs. Chenery’s private collection, has been on loan for the past several decades to the Kentucky Horse Park, where thousands of visitors may remember seeing it on display. If you want to know how far people used to go to own a piece of Secretariat memorabilia, just remember that they were selling bags of his manure (or so it was claimed) at Saratoga in 1973. So to actually own his Kentucky Derby armband is to own a piece of his historic record-setting victory on the first Saturday in May. It was this armband that flashed past every pole, running each quarter faster than the one before; a feat that most likely will never be duplicated. 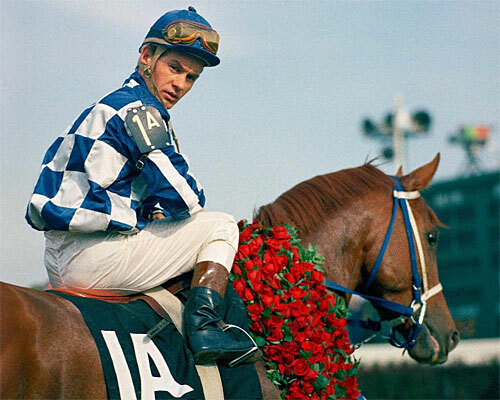 It also makes for a great conversation piece, as the 1A signifies Secretariat’s coupling with stablemate Angle Light, whose shocking upset victory over Big Red in the Wood Memorial created a whirlwind of controversy leading up to the Run for the Roses. It was that upset that fueled the doubters’ belief that, as a son of Bold Ruler, Secretariat would not be able to handle the mile and a quarter. Not being aware of the abscess in Secretariat’s mouth in the Wood Memorial, it made the colt’s record-shattering victory at Churchill Downs all the more stunning and left people with their jaws hanging. Even owner Penny Tweedy and trainer Lucien Laurin were concerned seeing Big Red so far back early. Was this going to be a repeat of the Wood Memorial? Having syndicated Secretariat for an unheard of $6,080,000, the pressure was enormous, not only to win the Derby, but sweep the Triple Crown. Passing the finish line the first time, Secretariat was dead last, which means 12 jockeys would soon see that 1A armband fly by them, building up speed with every quarter — :25 1/5, :24, :23 4/5, :23 2/5, :23. Secretariat charged by his main rival Sham turning for home and drew off to a 2 1/2-length victory, with an eight-length gap back to the third horse, Flamingo Stakes winner Our Native, and future Horse of the Year and Hall of Famer Forego finishing fourth. It has been 44 years since Secretariat defeated Sham in a blazing 1:59 2/5 for the mile and a quarter, and in all that time only one horse, Monarchos, has even broken the two-minute mark, over arguably the fastest track in Derby history. 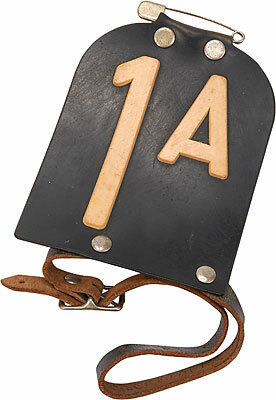 The 1A armband would come to signify Secretariat’s ability to avenge his defeats in a crushing manner, as Angle Light, the horse that nearly toppled the empire, would finish 21 lengths behind Big Red in the Derby, just as Onion would finish up the track in Secretariat’s record victory in the Marlboro Cup following his shocking upset in the Whitney when Secretariat was incubating a virus. So, what might seem to be just an armband actually is a piece of history, evoking memories and telling the story of Secretariat’s ascent from the Wood Memorial debacle to his rise to superstardom in the Kentucky Derby. When the garland of black-eyed susans was draped over Secretariat’s withers following his victory in the Preakness Stakes, it became more of a revelation than a celebration. As Big Red stood tall in the winner’s circle, decked out in yellow and black, the same thought hit everyone at once. The 25-year Triple Crown drought was all but over. All that was required was the coronation in the Belmont Stakes. Not only had Secretariat vanquished his main rival Sham once again by the same 2 1/2-length margin as the Kentucky Derby, with the same eight-length margin back to the third horse, Our Native, he did it by launching the most breathtaking move on the first turn ever witnessed on a racetrack. The victory once again was emphatic, but the final time was disputed for years. It would be nearly four decades before Maryland Racing Commission officials confirmed what everyone already knew: Secretariat had set the Preakness record at 1:53. Although a handful of Sham supporters still held out hope the mile and a half distance of the Belmont Stakes would favor the Derby and Preakness runner-up, the vast majority of racing fans waited anxiously for the procession that was expected at Belmont Park. After all, any horse who could make the move that Secretariat did that early in a race and still go on to score an emphatic victory was not going to get beat over a big galloping track like Belmont. It was only a question of how far he would win by and how fast he could run over what likely would be a souped up racetrack. That move by Secretariat is firmly entrenched in Preakness and Triple Crown lore, and his humongous stride as he prepared to ignite the biggest explosion ever witnessed at Pimlico Race Course is on display in a magnificent statue that dominates the Belmont Park paddock. Aside from Secretariat’s regular jockey Ron Turcotte, the person best equipped to describe the power of Secretariat as he stormed to the lead from last place in less than a quarter of a mile was jockey George Cusimano, who was aboard the pacesetting Ecole Etage. That was the power of Secretariat; never more in evidence than on that first turn at Pimlico. 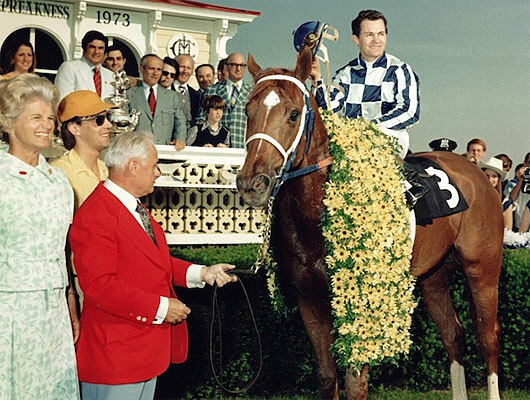 All three of Secretariat’s Triple Crown victories were highlighted by a special event. In the Kentucky Derby, he ran each quarter faster than the one before. In the Preakness, his last-to-first move was unlike anything ever seen. And, of course, it would serve as a prelude to the most spectacular victory in racing history in the Belmont Stakes. All you have to say is 31 lengths and 2:24. So, when you look at Secretariat’s Preakness victory blanket and hold it in your arms, remember that moment when it was placed on his back, adorning the Pimlico winner’s circle and affirming everyone’s belief that history was about to be made in three weeks. To own a piece of memorabilia from Secretariat’s Belmont Stakes is like owning something hallowed — something that exemplifies the very essence of Thoroughbred racing. Throughout Secretariat’s summer and fall campaign and culminating with his journey to Claiborne Farm, where he retired to stud, Big Red’s Belmont Stakes cooler became a recognizable part of his wardrobe. 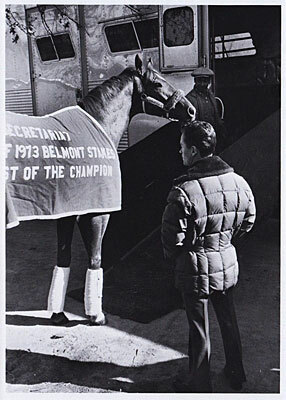 As the big horse prepared to board the van that would take him to his new home, jockey Ron Turcotte stood a couple of feet away, staring at the words, “Secretariat…Winner of 1973 Belmont Stakes…The Test of the Champion,” as if remembering that one historic moment in time that would forever set new standards of greatness. A victory so spectacular, it seemed to raise the equine genus up a notch. Although there are numerous videos of Secretariat’s epic 31-length victory in a mind-boggling 2:24, most of them have faded through the years and can only be seen through washed out colors and cloudy images. So it is all the more important to be able to preserve any connection to that race, especially something as personal as the cooler presented to him that he would have great use for the remainder of his career. You not only are owning a part of racing history, you are owning a part of Secretariat himself. Beneath that cooler was a heart that weighed nearly three times that of the average Thoroughbred heart. No one will ever forget the excitement leading up to that Belmont Stakes, whether you were among those fortunate enough to attend or whether you just watched on TV. To demonstrate the confidence people had in Big Red, and how sure they were he would make history on June 9, 1973, he was put on the cover of Time, Newsweek, and Sports Illustrated between the Preakness and Belmont Stakes. Not only was it unprecedented, but a defeat at Belmont would make it one of the most ill-timed moves in the annals of magazine publishing. As recorded in the history books, Secretariat battled with his archrival Sham through seemingly suicidal fractions of :46 1/5 and 1:09 4/5 before Big Red ran Sham into the ground and began the procession everyone had been hoping to see. So was born track announcer Chic Anderson’s memorable call, “Secretariat is moving like a tremendous machine,” a moment still frozen in time after more than four decades. As Big Red charged down the stretch in isolated splendor, increasing his lead with every stride, the grandstand was a sea of clapping hands, waving arms, and pumped fists flailing about. The 25-year drought was over. America had its first Triple Crown winner since the immortal Citation. But everyone knew that no matter how many would follow, this was the one that would rise above them all. And they were right. Forty four years have passed and no horse has come even remotely close to challenging Secretariat’s otherworldly record, which had shattered Gallant Man’s record by two and three-fifth seconds. That means the previous record holder would have finished 13 lengths behind Secretariat. So one can see why Secretariat’s Belmont cooler is much more than a piece of cloth. 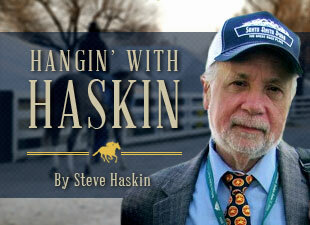 It is in fact an iconic chapter unto itself in the annals of racing. And will be for all time. Some trophies are earned more than others. In the majority of races in which jockey Braulio Baeza rode the legendary Dr. Fager, he fought a losing battle trying to restrain the hot-blooded colt. All he could do was hold on and go along for the ride. But in the 1968 Suburban Handicap, in which Dr. Fager was facing his arch rival Damascus, the silver trophy did not come easy. To demonstrate the high regard in which both colts were held, Damascus was assigned topweight of 133 pounds, with Dr. Fager carrying 132 pounds. Trainer John Nerud had let Dr. Fager’s mane grow over the winter in order to give him a wilder look, and, with his running style and long mane blowing in the wind, he bore more of a resemblance to an untamed mustang running with reckless abandon than he did a Thoroughbred racehorse. There was never a horse that ran with Dr. Fager early who was anywhere close at the finish. The Doc’s blazing speed at all distances and fierce competitive spirit made him one of the most intimidating horses in racing history. So, when Damascus’ rabbit, Hedevar, was scratched the morning of the Suburban, it meant a change of strategy for the defending Horse of the Year. With Dr. Fager loose on a slow, uncontested lead, Damascus was now on a solo mission, and jockey Manny Ycaza had no choice but to put the colt into the fray early and test Dr. Fager, who had managed to get away with an opening half in :48 2/5, which was trotting horse time for the Doc. Ycaza took Damascus off the rail and started pushing hard to get him to close the gap on Dr. Fager. Although taken completely out of his game plan, Damascus was able to collar Dr. Fager as they headed down the backstretch. The battle everyone had wanted to see for so long was on. Damascus pulled to within a neck of Dr. Fager, but that was as close as the Doc would let him get. He loved a challenge; that’s when those nostrils would flare and the daggers would shoot from his eyes. The pair battled through the third quarter in a spectacular :22 3/5, and that’s with 132 and 133 pounds on their back. With his initial attack thwarted, Ycaza backed off slightly and let Damascus regroup. This was not his game, and Ycaza had to make sure he saved something for the end. Around the far turn, Dr. Fager began inching away, but, amazingly, Damascus wasn’t through. He gave it one final desperate try, pulling back alongside Dr. Fager for the third time, and actually might have gotten his nose in front nearing the quarter pole after a testing quarter in :23 3/5. As they came out of the turn locked together, Dr. Fager refused to yield. Turning for home, a weary Damascus had no more to give. Dr. Fager bounded clear, opening up by two lengths at the eighth pole. Baeza merely hand rode Dr. Fager to the wire, winning by two lengths over late-closing Bold Hour. Even with the sluggish opening half and carrying 132 pounds, Dr. Fager still was able to equal Gun Bow’s track record of 1:59 3/5. In the end, this day belonged to Dr. Fager, but it was the epic battle between racing’s two titans that will be remembered. Baeza had to take a great deal of pride in the victory as he held the trophy, knowing this was one he had earned. It was the summer of 1969, and the nation was reeling. Still shell shocked by the assassinations of Martin Luther King Jr. and Robert F. Kennedy and the My Lai Massacre a year before, bloodied by the Vietnam War and student protests at home, and now staggering from the tragedy at Chappaquiddick and the horror of the Manson murders, America needed a reprieve. On the very same weekend while Woodstock raged on in a field downstate, a hero quietly emerged out of Saratoga. One never knows why or when the public is going to give a horse to hero status. For Rokeby Stable’s Arts and Letters that honor came in the 1969 Travers Stakes. And it came before the race. The evidence could be seen in a startling Sports Illustrated photo taken from above the tree where Arts and Letters was being saddled. In those days, the horses were saddled at designated trees right there among the public, who would gather round their favorite horse for a close-up look. This particular photo, from its high vantage point, showed something no one had ever seen before at Saratoga – a crowd some eight to 10 deep encircling the tree. Arts and Letters had become the people’s horse, and he hadn’t even run yet that day. The son of Ribot did not disappoint his fans, winning the Travers by 6 1/2 lengths, equaling the track record held by Damascus, Buckpasser, and Jaipur. Of the four horses who held the record, two of them were ridden by Braulio Baeza (Arts and Letters and Buckpasser). 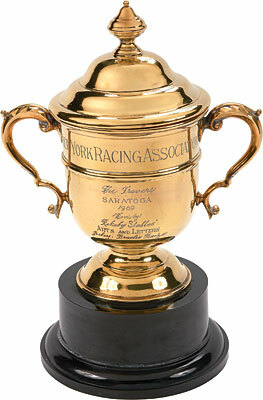 The gold Travers trophy, which Baeza had previously won on Buckpasser, represented a changing of the guard in 1969. It was naturally assumed that Majestic Prince, the undefeated California phenom, would be America’s leading 3-year-old following his easy victory in the Santa Anita Derby and his gutsy wins over Arts and Letters in the Kentucky Derby, by a neck, and Preakness Stakes, by a head. Elliott Burch, trainer of Arts and Letters, made his usual bold move by running the colt back in the Metropolitan Handicap, and he defeated older horses convincingly by 2 1/2 lengths. That set him up for a rematch with Majestic Prince in the Belmont Stakes, and Arts and Letters had no trouble with the Prince this time, winning by 5 1/2 lengths. When he returned with a rousing 10-length victory in the Jim Dandy Stakes, it was only a question of by how far he would win the Travers. His growing legion of fans was not disappointed as Arts and Letters crushed the late-running Dike. That victory enabled him to take over the leadership in the 3-year-old division, paving the way for victories in the Woodward Stakes and Jockey Club Gold Cup, a Horse of the Year title, and induction into the Hall of Fame. So when you frame it against the chaotic backdrop that was August 1969, the Travers trophy represents a lot more than just a victory in a horse race. For a brief moment in that momentous summer, a brilliant and talented racehorse named Arts and Letters brought a bit of stability and purity to the world during tumultuous times.